"A powerful weapon that is difficult to deflect." Lock the Keyhole in Agrabah. "Obtained in Agrabah. Fairly strong with a fast swing." 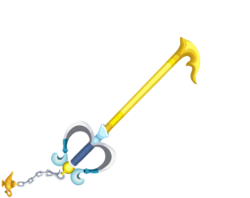 "A combo-mod Keyblade capable of a string of hits. Its powers will bring you great treasure." Slay 50 enemies with the Three Wishes. Slay 100 enemies with the Three Wishes. Slay 150 enemies with the Three Wishes. Slay 200 enemies with the Three Wishes. The Three Wishes is a Keychain for Sora's and Player's Keyblade that appears in Kingdom Hearts, Kingdom Hearts Chain of Memories, Kingdom Hearts Re:coded, and Kingdom Hearts χ. In Kingdom Hearts, Aladdin gives Sora the Three Wishes Keychain once he locks Agrabah's Keyhole. In Kingdom Hearts Chain of Memories, the Three Wishes is the signature Attack Card for Agrabah. 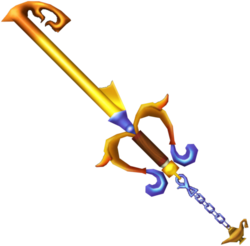 In Kingdom Hearts 358/2 Days, during Roxas's dreams of when Sora lost his Keyblade to Riku at Hollow Bastion, the Keyblade is in its Three Wishes form. In Kingdom Hearts Re:coded, the Three Wishes is received after Data-Sora defeats Jafar. The Three Wishes's design differs depending on its upgrades, most of which are seen in Kingdom Hearts χ. The default Three Wishes has a dull wooden handle and bronze pommel. The guard is a reddish brown, and is shaped like a curled heart with small "wings," but its base is golden, as is the base of the blade. The blade is bronze and featureless, and the teeth are a reddish bronze. The teeth do not form a complete number 3, only curling halfway toward the blade. The Keychain's links are also bronze, and the token is a dull version of Genie's lamp. The first upgrade has a blue handle and a silver guard with a sky-blue base. The base of the blade is now blue, with the blade itself now a bright gold. The teeth are a slightly darker shade of gold. The links of the Keychain are now silver, and Genie's lamp is gold. 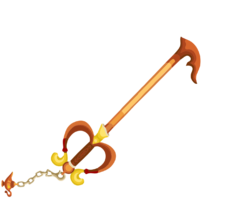 The second upgrade, also seen in Kingdom Hearts, has a simple, wooden handle with a yellow pommel. The guard is predominantly gold, though its base is sky blue. The base of the blade is sky blue, but the rest of the blade is gold, with a point emerging near the base. The teeth are a bronze color, and they arc downward from the tip of the blade in the shape of a stylized number 3. The Keychain is made of several metallic blue links, and Genie's lamp is the same color as it normally is in the series. The third upgrade reuses the first's blue handle, silver guard with sky-blue bases, now with gold accents. However, the guard now has blue wings emerging from the base of the blade. 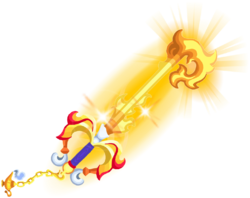 The blade retains its sky-blue base and gold coloration, but the point emerging from above the base from the Kingdom Hearts iteration is now a small, golden flame. The teeth maintain its 3 shape, but are now elaborate and flame-like in appearance. The Keychain's links are now a darker blue than its Kingdom Hearts iteration, but the lamp is brighter in coloration. The fourth upgrade features a fiery, elaborate guard with silver bases. The blade now has a silver base, and it is now a fiery gold, with flaming protrusions from the sides, as do the teeth. The Keychain's links are now golden, and the lamp appears to have smoke emerging form it. 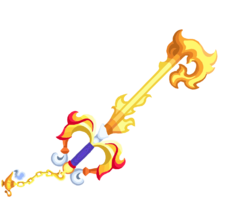 The fifth upgrade gives the Keyblade a powerful, swirling orange aura. 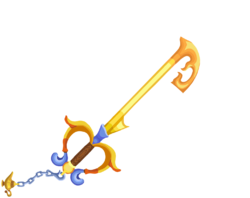 The Keyblade's English name is a reference to the number of wishes that Genie can grant. Its Japanese name, "Desire Lamp", references the lamp Genie is trapped in, and his ability to make real the desires of his master. Artwork of the Three Wishes. This page was last edited on 19 April 2019, at 12:35.